What’s more blissful than a weekend away full of quality time with your other half? Living in Central Florida means being surrounded by stunning beaches and hip cities in all directions. And with many locales just a few hours’ drive from Orlando, whisking your date away for the weekend couldn’t be easier. 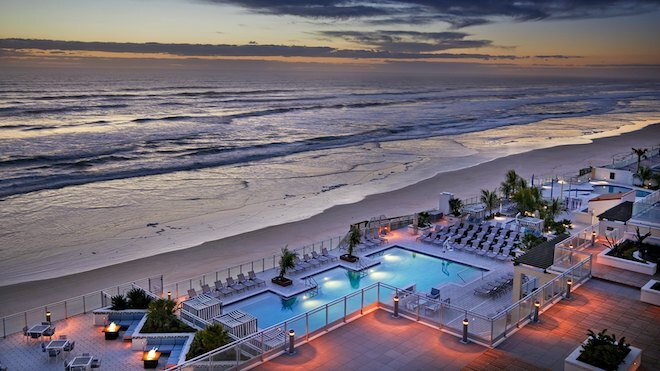 Here are our top picks for romantic weekend getaways from Orlando. This beachy getaway is no secret to Orlandoans; it’s one of the closest beaches to Orlando. But there’s more to New Smyrna Beach than the pretty coastline. Spend your days exploring nearby ruins, climbing the historic Ponce Inlet Lighthouse, and checking out the abundance of local art at The Hub on Canal. Time your visit with the monthly art stroll or craft beer walk for extra fun. Foodies are spoiled for choice here, but a few favorites are Third Wave Café & Wine Bar (beautiful atmosphere and great Neapolitan pizza), The Garlic (Tuscan cuisine by the water), and Breakers Restaurant (beachfront burgers served in a no-frills setting). Say Daytona and NASCAR likely springs to mind. It’s an integral part of this Atlantic coast beach, but so is the arts and culture scene, summertime concert series, and outdoor adventures. Embark on a dolphin and manatee paddleboard tour with Three Brothers Boards, or hunt for murals that are part of the Art in the Alley initiative. And yes, you can always tour the Daytona International Speedway, or splurge on a NASCAR Ride Along. Feast on Tex-Mex at Cocina 214 (which also has a Winter Park outpost) and stop by Mai Tai Bar to sip on a beachy cocktail before retiring to your room for the night. How about spending a weekend exploring Orlando’s sister city? Tampa is a cool city with unique neighborhoods rich with history, culture, and foodie hotspots. History lovers should head to Ybor City, a vibrant area of Tampa rich with Cuban roots most famous for once being the “Cigar Capital of the World.” Hop on a walking tour to explore everything from food to history and cigars. Downtown, take a stroll down the 2.4-mile Tampa Riverwalk connecting parks and attractions. Craft beer lovers and foodies could easily spend the weekend just eating and drinking. Check out a few local breweries while you’re in town and don’t miss Tampa Heights’ hip food halls, The Hall on Franklin and Armature Works. And of course, it wouldn’t be a romantic getaway without a fancy meal at Bern’s Steak House. Check out our sister site, Tampa Bay Date Night Guide, for local recommendations. This walkable city with Scottish roots boasts three state parks with pristine beaches, multiple craft breweries, plus a vibrant arts scene and fun events, like the annual Dunedin Highland Games. In Dunedin, you’ll love being able to split your time between lazing on the beach at Honeymoon Island State Park (or the more remote Caladesi Island, accessible only by boat and ferry) and exploring the city. For eats, chow down on BBQ at The Dunedin Smokehouse, or splurge on an artfully-presented meal at The Restorative. Dunedin Brewery is Florida’s oldest craft brewery; try their signature Apricot Peach Ale with an order of tater tot poutine. St. Pete has it all: stunning, white sand beaches plus a lively downtown with enough breweries, shops, museums, and restaurants to keep any couple busy for days. Most notable is the iconic Dali Museum, home to an impressive collection of Salvador Dali’s surrealist works. You can even step into a painting with the museum’s free virtual reality experience. Go mural spotting while riding bikes along the Fred Marquis Pinellas Trail, and immerse yourself in nature at the picturesque Sunken Gardens. No matter where you end up downtown, you’ll likely be within walking distance of an awesome restaurant or bar. A Cuban sandwich from Bodega, DIY doughnuts from Mini Doughnut Factory, and a burger at Engine No. 9 are all worthy of inclusion on your St. Pete food bucket list. St. Augustine is workable as a day trip, but staying a few nights gives you ample time to visit the highlights and discover a few local gems along the way. Save time and get a fantastic overview of the city by purchasing tickets for one of the hop-on-hop-off trolley tours. Old Town Trolley Tours and Ripley’s Red Train Tours both sell multi-day tickets, some with combo admission to other attractions. Castillo de San Marcos, Flagler College and the St. Augustine Lighthouse are all must-see attractions. There are plenty of wonderful places to dine, but The Ice Plant is in a league of its own, featuring a menu of craft cocktails and elevated fare served in St. Augustine’s old ice factory. The secret is getting out about Anna Maria Island, a gorgeous 7-mile stretch of paradise on the Gulf coast. With turquoise waters reminiscent of the Bahamas, breathtaking sunsets, and relatively low crowds, it’s one of my favorite beaches in all of Florida. Your best bet is to visit in May or early December (January-mid March are best avoided due to traffic and an influx of travelers). In between peaceful afternoons on the beach, kayak through a mangrove tunnel while exploring Robinson Preserve (rent kayaks from Surfer Bus). You can also catch the free trolley to explore other parts of the island, like Pine Avenue, which is full of shops, galleries, and several restaurants. Start your day with made-to-order donuts at The Donut Experiment, linger over a Tex-Mex lunch at Wicked Cantina, have a fancy dinner at The Waterfront Restaurant, and then end with a nightcap at The Doctor’s Office, serving up delectable cocktails in a bustling atmosphere. Just several miles from the Georgia border you’ll find Amelia Island, a 13-mile barrier island ideal for a weekend escape. Keep a relaxed pace, splitting time between the beach and activities like guided Segway tours, horseback riding on the beach, and shopping at Fernandina Beach. Dining best bets include scrumptious seafood from Timoti’s Seafood Shak, upscale fare at Verandah, and Southern American eats from Gilbert’s Underground Kitchen. Head south to Boca Grande, a tiny beach town located on the Gulf coast on Gasparilla Island. The price of admission is a $6 toll to gain entry to the causeway linking the island to the mainland, but the nominal fee is worth every penny. Rent bikes to cruise along the island’s 6.5-mile biking trail, stopping at the Boca Grande Lighthouse Museum and in downtown Boca Grande. If you feel the itch to explore somewhere new, travel off the island to Cayo Costa State Park, home to 9 miles of protected beaches only accessible by boat and ferry. There are tons of dining options, but don’t miss a lobster roll from Newlin’s. Art deco architecture, gorgeous beaches, ample nightlife and top-rated restaurants all contribute to Miami’s allure. Where other beachfront Florida locales beckon you to slow your pace, Miami invites you to amp it up with culture, flavor, and flair and you won’t find elsewhere in Florida. Make your home base somewhere in Mid-beach, notably quieter than the more popular South Beach. Spend an afternoon exploring the ever-changing murals in Wynwood or visiting the Pérez Art Museum, home to an eclectic collection of contemporary and modern art. Treat yourself to a fancy date night at SUGARCANE raw bar grill in Midtown, or a drool-worthy lobster roll at Izzy’s Fish & Oyster. Coyo Taco is a budget-friendly option for taco lovers, smack dab in the heart of Wynwood. Check out all of the posts in our Three Perfect Days getaway series, or browse all of our getaway posts for more ideas. Disclosure: Hard Rock Hotel Daytona Beach is one of our valued advertising partners.